They were supposed to be tired for the 5 hours travel or for the trip few hours earlier in Milan, but when they arrived in Venice Saint Lucia train station, the air of the sea and the fascination of Venice corroborated Andrew and Mai spirit who just just rushed to the "vaporetto" (public ferry boat) to get their run to "Rialto" where they had booked a nice room for the night. The two were no more in their skin, while the vaporetto kept going slowly to their destination revealing the beauty of the Serenissima City of Venice, they didn't feel any hunger or tiredness, only the desire to explore the city fulfilled their hearts. Reached their hotel and stunned by the beauty of their room, they could just drop off the bags to be back on the "calle", "porteghi" and "campi" (streets of Venice are named as calle or portego, while the squares are named "campi", all besides "piazza" St Mark). 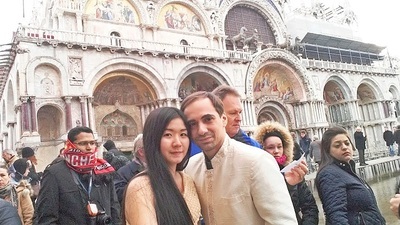 ​Direction Piazza Saint Marco, for a sneak peak of one of the most beautiful places in the world in the early night. Piazza San Marco, often known in English as St Mark's Square, is the principal public square of Venice, where it is generally known just as "the Piazza" (la Piazza). 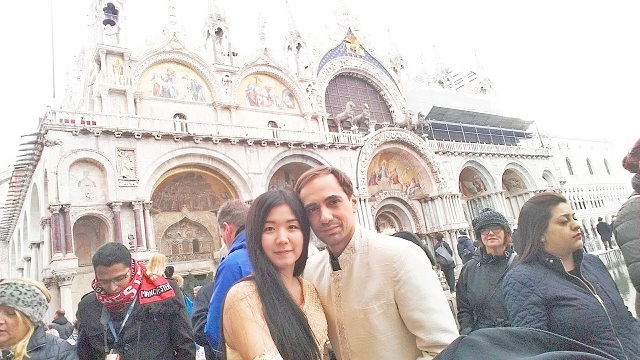 It is historically the social, religious and political center of Venice. Every step was toward to happiness, in not too long they were there and the sight was just out of this world. "Tomorrow we are going to have amazing pictures" - said Mai, who was a bit upset from the impossibility to take some shoots straight away for absence of an adequate light. "Just enjoy the view" - said Andrew - "There is no picture or painting in the world that can really catch the beauty of this sight and the emotions you are feeling". She agreed and her staring at the monuments of the square and the dark night sea became more intense moment after moment. Some time later the two were having a fast dinner in a bar with some sandwiches and local wine. Was about midnight when after some other cruising through porteghi and calli they finally got to their bed. Early morning they were just up, the emotion to see the Piazza again in daylight was just too strong to let them rest a little more in bed. 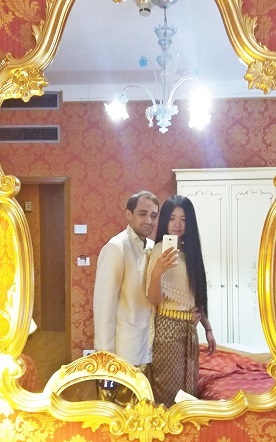 By 7 in the morning they were dressed up and ready to go for their breakfast. The weather was freezing cold (minus 4!!!! ), the sky pretty dark, a soft but really cold wind made the two very uncomfortable in their light dresses even under the warm coats they were wrapped in. Andrew had a coffee and Mai a cappuccino, a few different pastries completed a rich breakfast in Italian style. 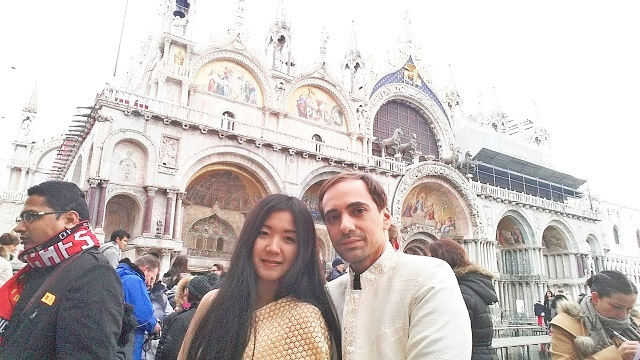 When few minutes later they reached the San Marco, they found that because of a high tide the square was under a few centimeters of water. "Well, let's hope our shoes can save our feet from getting drenched" - said Andrew, who jumped straight away from a temporary walkway set up in front of St Mark Basilica. 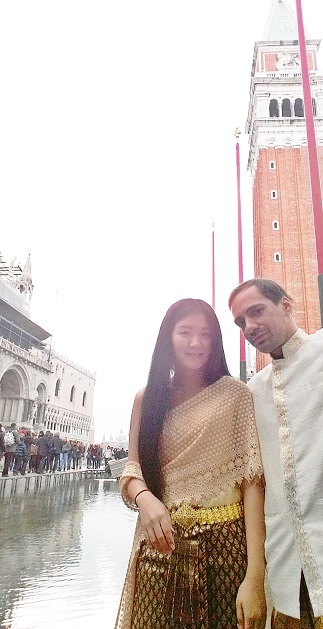 Mai followed a second after, off their coats and their selfies were immortalizing them standing in the main square of Venice in their Thai traditional wedding clothes. "If I don't get sick today, I will never again in my life" - said Mai nicely smiling. "Let's go back to the hotel to wear warmer clothes" - answered Andrew. 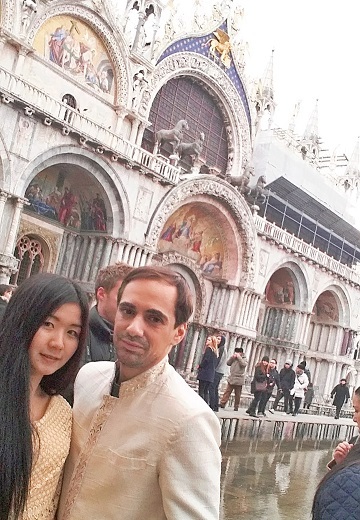 Dismissed the wedding clothes, the two spent the rest of the day in Venice, walking without a real destination and loosing the path again and again to discover the treasures of the Serenissima. 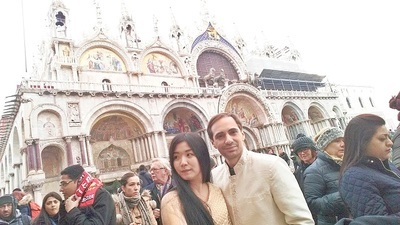 After some shopping next to Rialto and a nice meal of seafood and fish, they left Venice with a bit of nostalgia for not having more time and resources to spend there but planning new trips.